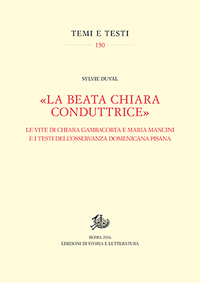 Sylvie Duval's book offers a critical edition of three important texts associated with the Dominican Observant Reform Movement and the San Domenico Convent in Pisa: the Necrologio of the San Domenico Convent; the Vita of the blessed Chiara Gambacorta, the celebrated abbess of the convent; and the Vita of another Dominican nun from San Domenico and its third abbess, Maria Mancini. The edition appears in the prestigious series "Scritture nel chiostro" edited by the celebrated Florentine historian of female saints and spirituality Gabriella Zarri from the University of Florence. The book, which was developed from a PhD dissertation, is a very fine example of a philological and paleographical approach to medieval sources. Chiara Gambacorta is venerated as a beata by the Catholic Church, as a local saint by Pisans, and as a key figure in the history of the Dominican Order's Observant Movement. Born in 1362, she was the daughter of Pietro Gambacorta, who became the ruler of Pisa shortly after her birth. Called Tora by her family, she was married at thirteen and widowed by age fifteen. To avoid another arranged marriage, Tora entered a Franciscan convent in Pisa and took the name Chiara; her enraged family removed her from the convent and confined her for several months. Through Chiara's perseverance and the influence of Catherine of Siena and Alfonso Pecha da Vadaterra, the Bishop of Jaen, who was the last confessor of St. Birgitta of Sweden, Chiara's father was persuaded to consent to his daughter's vocation and ultimately built a new convent for her. Although she had initially chosen a Franciscan house, Chiara's final choice was the Dominican Order, and with the support of her father she founded a convent in honor of San Domenico (approved by the papacy in 1385). Chiara was inspired by St. Catherine of Siena and modeled the convent on the observance of the Dominican Order. Life in the convent involved strict enclosure, austerities, communal life, and careful attention to Dominican customs and liturgies. Chiara was elected prioress of San Domenico in 1395 and held that position until her death in 1419. Duval's book begins with a useful historical introduction that deals with the San Domenico Convent; the reform circle of the Dominican Observants in Pisa, Florence, and Venice and the network of individuals that embraced the blessed Giovanni Dominici (1356-1419), a famous Dominican preacher and reformer; Tommaso da Siena (1350-1434), another Dominican reformer; and various religious women. There was also a circle of Dominicans and lay supporters in Tuscany that included the Alberti family, the lawyer for the Florentine hospital of Santa Maria Nuova Ser Lapo Mazzei; the Pratese merchant Francesco Datini; the preacher and Observant leader Giovanni Dominici; and Chiara Gambacorta. Dominici, the leader and spiritual mentor of this group, was very close to Chiara, who had expressed her admiration for his sermons, and there were ongoing contacts between Corpus Domini, the monastery Dominici founded in Venice, and the Pisan convent of San Domenico. 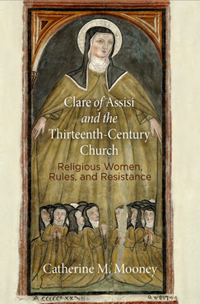 Duval posits interesting connections between the Dominican Chiara Gambacorta and other female saints including St. Clare of Assisi (1194-1253), St. Catherine of Siena (1347-1380), and St. Birgitta of Sweden (1303-1373), and describes the close relationships among the different orders. Although she eventually joined the Dominican Order, Chiara chose St. Clare as her role model. As Dominici, Chiara was also a devoted disciple of St. Catherine of Siena, and both expressed their admiration for Catherine in various letters in which they praised her greatness. From another perspective, Chiara was especially devoted to the writings and spirituality of St. Birgitta. She knew Birgitta's confessor and commissioned sermons and works of art in her honor. She maintained such a close relationship with the Birgittines in Florence that it was said that at one point she considered joining them. Similarly to Chiara, the other female nun discussed in Duval's book, Maria Mancini, focused her work on the Revelations of St. Birgitta. Having heard about St. Birgitta, Mancini desired to see her and was blessed with a vision of the Swedish saint, who instructed her. Chiara's and Mancini's devotion illustrate St. Birgitta's legacy in Italy and how their authorial voices were fashioned on Birgitta's Revelations. Following the historical survey, there is a detailed introduction to each of the individual texts and a meticulous examination of the manuscripts followed by a linguistic analysis. The edition is accompanied by a detailed technical apparatus explicating the criteria for the editions, descriptions of the manuscripts examined, and surveys of the stylistic variations among the different primary sources. The first text is the Vita of Chiara Gambacorta, and Duval explains that it is pragmatic, focusing in its first eight chapters on the youth of Chiara, on the objections of her family to her choice of religious vocation, and on her determination to take holy orders. This is a well-known motif in female hagiography, found, for example, in the Vita of St. Clare of Assisi. The rest of the text is devoted to Chiara's pastoral life and leadership in San Domenico. The second text is the Vita of Maria Mancini, who is a much obscure figure in historical research. Duval's version of her life is its only modern edition. Here the medieval characteristic of the text is apparent as it presents a list of holy miracles and supernatural events. 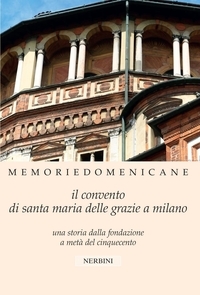 It is striking to compare the two hagiographic texts: the first, depicting the life of Chiara, is a practical autobiography of a religious leader and the second is concerned with the generic holy life of Maria Mancini. On the whole, Duval's book is an important contribution to the field of female spirituality and provides us with a reliable edition of three intriguing texts manifesting female monastic life in Italy. See Niccola Zucchelli: La Beata Chiara Gambacorta: La Chiesa ed il Convento di San Domenico in Pisa, Pisa 1914. 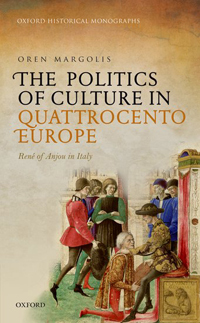 See Ann M. Roberts: Chiara Gambacorta of Pisa as Patroness of the Arts, in: Creative Women in Medieval and Early Modern Italy, ed. by E. Ann Matter / John Coakley, Philadelphia 1994, 120-54; Ann M. Roberts: Dominican Women and Renaissance Art: The Convent of San Domenico of Pisa, Aldershot / Burlington 2008. See Daniel Bornstein: Life and Death in a Venetian Convent. The Chronicle and Necrology of Corpus Domini, 1395-1436, Chicago 2000.